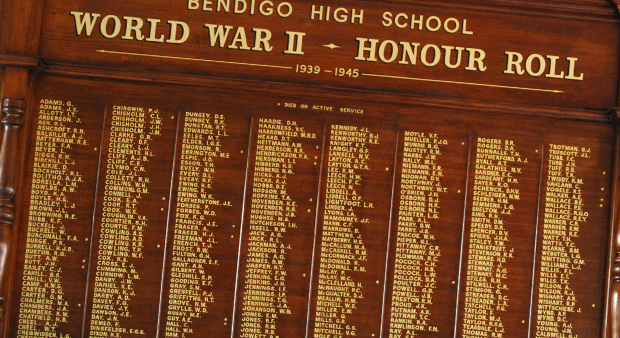 The college has three impressive world war honour rolls, listing names of serving students from Bendigo High School and the antecedent schools; St Andrews’ College, Sandhurst Grammar School and the Corporate School. On the Friday of Armistice week an assembly was held in the quadrangle of Bendigo High School. Mr King read the Honour Roll and patriotic songs were sung. On June 23rd, 1919, the school held a special ceremony to unveil its traditional wooden Honour Roll board, in the presence of many notable guests, friends of the school and students. The school cadets presented arms as Brigadier-General Brand drew aside the Union Jack to reveal 160 inscribed names. The guard of honour reversed arms while the names of those fallen were read. Buglers then played the last post. The Honour Roll for the Old Boys of St Andrew’s College, the Corporate School and Sandhurst Grammar School was unveiled on March 3rd, 1920, by General Birdwood. It was restored and rededicated as part of the school’s centenary celebrations in 2007. An Honour Board to recognise World War II veterans was unveiled as a special part of the annual ANZAC Ceremony on April 6th. The unveiling was carried out by ex-students and veterans Victor Cahill and Warwick Johanson, in James King Hall. The board was made by Guilmartins, from Bendigo. The traditional hand drawn lettering and the finishing was done by signwriter Graeme Sinnbeck, from Charlton. The event represented the culmination of significant research by Old Gold member Jean Capuano, who was awarded Honorary Life Membership by Old Gold, in acknowledgement of the years spent undertaking the immeasurable research that was involved. A special book was made available, which contained stories of five servicemen listed on the honour board, to provide insight into their life journey from their times as a student at ‘The School on the Hill’. The book was compiled by Jenny Moloney, with photos supplied from Old Gold Alumni. by Wendy Talbot. The development of the World War II Honour Board was made possible by a Department of Veterans’ Affairs Saluting Their Service Commemorations grant of $4000 and a matched contribution from Old Gold Alumni.